The holidays are going by so quick and before we know it, Christmas day will be upon us. The malls have been absolutely packed with frantic shoppers and the stores are an absolute mess by the end of the day. I feel awful for those who have to tidy the stores once the doors finally close for the night. I cannot even imagine doing their job; therefore, be nice when a sales associate helps you with your shopping and do not leave a path of destruction in your wake. 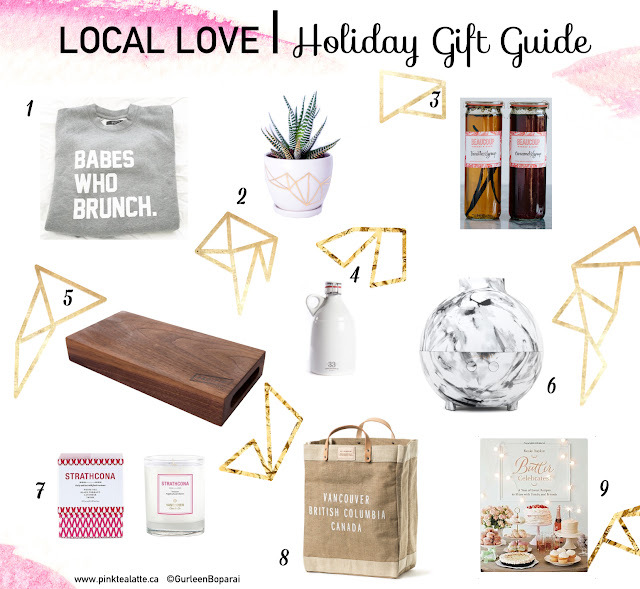 This year, I wanted to focus on a gift guide that highlights local Vancouver talent and point out some more unique gift ideas. I have taken the time to compile a list of 9 fabulous presents that anyone would be overjoyed to receive. If I missed an item that you feel should have been included, please do leave it in the comments below! This is one item that I am crossing my fingers for to receive as a gift. I have watched this Vancouver-based brand flourish over the short span of two years and launching their first full collection this Fall 2016. Yup, the boss babes behind this brand released their first sweatshirts in early 2015. Their crewnecks are warm and cozy and something you will probably reach for everyday. Their flakey croissants are legendary amongst Vancouverites and the person who brings a box of Beacoup croissants to the office is probably everyone's favourite co-worker. I would not complain if I got one of their almond croissants as a present, but I would devour it in seconds. I suggest gifting some of Beacoup's in house made infused syrups and sauces to the foodie in your life. They are all packaged in cute glass canning Weck jars which can be re-used after. Dana Mooney is a Vancouver-based artist who does stunning multi-media abstract paintings. For a second year in a row, Dana Mooney has teamed up with Sage Wellness to create this limited edition "Aroma Art" piece. A portion of the proceeds will go towards local charities. A great gift for anyone who loves aroma therapy. Technically, the Vancouver Market Bag is part of a bigger collection that is not exclusive to Old Faithful Shop (which happens to be a favourite store of mine! ), but I personally own one of these bags and they are amazing! These natural jute bags are handcrafted in Bangledash by women that are paid fairly. Vancouverites living on the west side of Vancouver have probably visited Butter bakery for their delicious marshmallows and cookies. 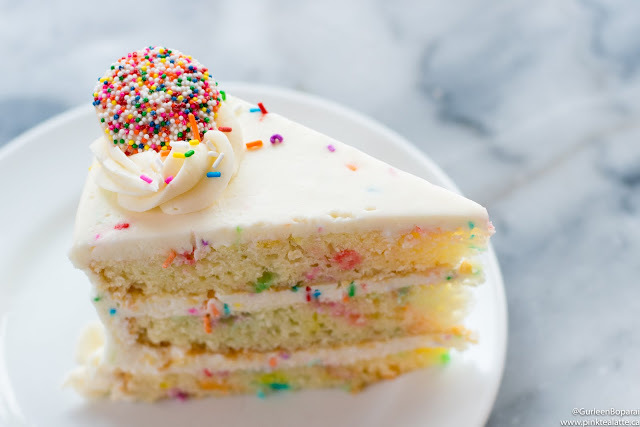 Owner Rosie Daykin published her second bake book featuring more of her family's recipes including baked goods available at her bakery, Butter. The perfect present for the baking fanatic in your life! I am in love with Pacific Design Lab's wood serving boards as they are truly stunning works of art! They are handcrafted at their Chinatown workshop in Vancouver and their team focuses on highlighting the woods' natural beauty. A quality wood board will last decades if cared for properly. Artisan Gabrielle has been working the pottery wheel since 2011 at her Vancouver studio. I really love the simplicity yet striking geometric design of her clay pieces. Her Fitzgerald collection is my favourite as it features white glaze pieces with unique geometric 18 karat gold design. The mini planter is a great piece to gift with a cute little succulent nestled inside! For the craft beer enthusiast in your life, why not gift them 33 Acres' stunning ceramic growler, available in both 64oz and 32oz. Of course, be sure to gift the growler filled with one of 33 Acres home brews. Who does not like a good candle? Especially something so cleverly branded and packaged. I cannot be the only one who is a sucker for presentation now can I? All of their candles are hand-poured at their Vancouver studio and come packaged in a gorgeous gift box. The best part, the candles smell amazing and are clean burning pure soy base. Let me know if you pick up any of those gifts for your friends and family! I know I will be grabbing some of these items for myself! The tape grid helps keep the stems in place when working with this tall cylindrical vase. Vancouver continues to grow as an urban city on the Pacific West Coat; however, despite the increasing concrete towers, Vancouverites remain grounded and appreciate the simple beauties of nature. Florists across the lower mainland help us appreciate the stunning flowers and foliage that we take for granted in our world. Many florists in Vancouver have made it a point to use as many local and seasonal stems in their arrangements to help us realize that our concrete towers cannot stop the natural beauty! I personally have always been mesmerized by the simple elegance of flowers, which is apparent by my equal ratio of flowers to food to clothing pictures on my Instagram. Whenever I receive a bouquet of flowers, I am overjoyed because even on the toughest of days, a beautiful floral arrangement always manages to make me smile. That is why I love having a vase of flowers in my entranceway, so when if I come home from a rough day, my spirits are instantly lifted as soon as I see the stunning floral arrangement. Unfortunately, I always manage to ruin the stunning design of the arrangement when I transfer the bouquet to a vase. In many instances, the stems are too long, so I usually end up disassembling the bouquet to trim down the stems. When Amy, the fabulous owner of Garden Party Flowers invited me to come learn about floral arrangements with one of her florists, I just could not pass the opportunity up! 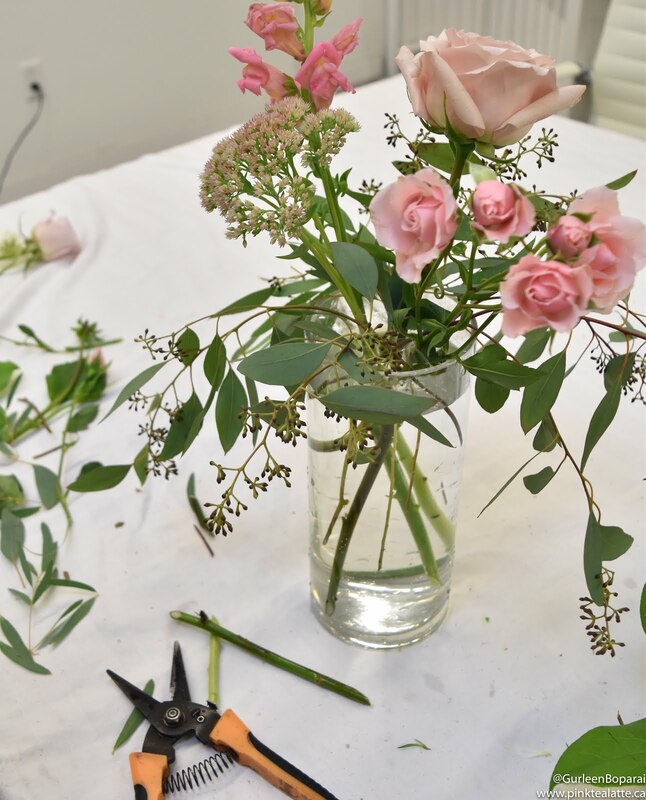 I had the pleasure of working with the florist Estefani who walked me through the basics of flower arrangement and design by using three different examples. The coolest part, this talented lady used the exact same flowers and greens for each of the three arrangements. 1. Trim the stems according to the height of the vase, but also the style of the design. 2. Remove any leaves that hit below the opening of the vase. Leaves touching the water creates more bacteria in the water; therefore, shortening the lifespan of the flowers. 3. Do not feel hesitant in removing the outer petals if they look wilted. The outermost flower petals are called guard petals since they protect the inner part of the flower. These and any other wilted petals can be removed. Before tackling any flower arrangement, consider the "style" and viewpoint of the design. The style will affect the type of flowers and greens she uses while the viewpoint affects the placement of the flowers as well as the overall shape of the design. So many varieties of eucalyptus! There are three general styles that arrangements are categorized as. Either compact/modern, which is a structured look with hardly any greens or a wild and modern style that is a little more compact and has some greens to give it a wild look. The last and more common style I see in Vancouver is the wild look, which uses flowers and greens that are more textured with less structure. For viewpoint, the florist is conscious of where the flowers and greens are positioned. An arrangement that will be in a middle of a dining table is going to be designed to be viewed from all around; however, if the flowers are going to be put in a corner, the back will only be greens as it is not going to be viewed from the back. I gravitated towards Garden Party Flowers’ arrangements as I love the aesthetic of the wild look and a lot of their work falls into that category. The Wild Look is a current trend for flower arrangements and I can only imagine it growing in popularity in Vancouver. I love the use of different types and interesting foliage layered with several varieties of flowers. There is a beautiful flow and story to a wild styled arrangement. I was genuinely amazed by the number of stems Estefani managed to fit into this single arrangement. When designing in any vase, you begin with the base greenery followed by the more interesting foliage greens and lastly building layers by adding in the flowers, while keeping in mind where the focal point will be. For this arrangement, we used Salal as the base green. Salal leaves are commonly used as a base green by florist because they give the arrangement lots of volume and help keep the flowers in place. After the Salal, she used a number of foliage greens beginning with beginning with three types of eucalyptus (seeded, dollar and feather), followed by an antique Hydrangea, Italian Ruscus and Sedum. I really liked the feather eucalyptus because it gave the arrangement a nice flow down the side of the vase. Unlike the base greenery, Salal, you get to be a lot more creative with the foliage placement and the shape of the arrangement starts to become visible. The flowers are always the best part and what makes the arrangement pop! Estefani actually entrusted me with the task of selecting the flowers from the walk-in cooler; however, she eventually had to step in as I was marching out of the door with every single flower that I could manage to grab. Keeping with a white and pink colour palette, the final arrangement used Dahlias, Ranunculus, Garden Roses, Spray Roses, Lisianthus, Sedum, and Snapdragon. My all-time favourite flowers are peonies [so basic of me!]. Unfortunately, they are not in season at this time; however, when those voluptuous pink buds are in season, I basically go on a season long binge. Peonies are stunning and I can never get enough of them! A good flower arrangement has balance and creates a flow for the viewer to follow with their eyes. This is achieved by using an odd number of stems for each type of flower or foliage. Some florists most commonly use three stems of the same kind of flower; however, for a more creative approach, it could be two stems of the same flower and one stem of a different flower. The three stems are placed within the vase in a triangle formation or a pentagon if five stems are used. By using an odd number of stems, it helps create layers within the arrangement and helps you determine the spaces and alignment of the where the next triad of stems should be placed. Estefani also focused on having the colours of the flowers contrast and complement each other. This is what makes floral arranging fun because it’s all about creating art piece and bringing it to life. On a wide rimmed vase like the cylinder one used for this arrangement, florists will sometimes use a technique referred to as the grid taping. Using scotch tape, a simple grid is created over the opening of the vase. The goal is to create little spaces in which the stems can be slotted into. The grid helps keep the stems in place making it easier when making a floral arrangement. 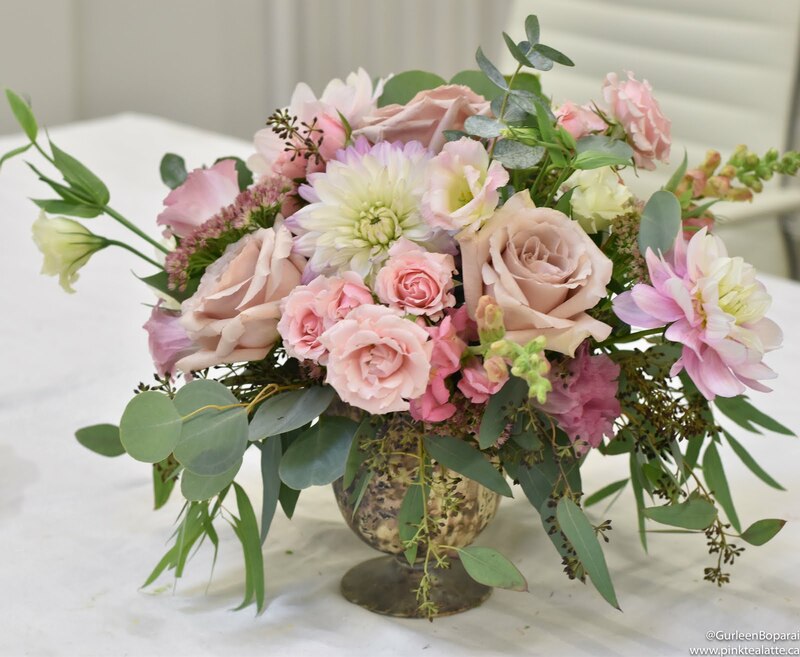 The florist also uses this to their advantage as they are able to position flowers at different angles and reposition the stems without shifting the rest of the design. Estefani recommends this for wider rimmed vases, as the smaller rimmed vases are able to hold the flowers in place themselves. The Mason jar is currently a huge trend for home decor and it would have been foolish of us to not use it for an arrangement. Unlike the cylindrical glass vase, the Mason jar is far shorter with a much smaller rim. To compensate for the smaller jar, Estefani excluded the base greenery, Salal, using only the more interesting foliage and flowers. The volume of the Salal would have overwhelmed the flowers in the small Mason jar. I always feel awful when I dismantle and discard parts of a gorgeous bouquet that a florist has worked hard to create, but ultimately, you want the flowers to be the focus with the unique foliage enhancing the design. As previously discussed, Estefani used an odd number of stems of each type of foliage and flower. Beginning with the foliage greens, she trimmed the stems to the height of where she wants them in the design by holding them up to the Mason jar at the angle she would be positioning the stem at. Therefore, the stems will not be all the same length; some will be short while others are longer this helps to create depth in the design. From the three arrangements that Estefani created, the Mason jar was my favourite! Perhaps it is my inner blogger that is biased towards the Mason jar being used as a vase, but I think it had to do more with the overall aesthetic of the arrangement. The flowers stood tall and prominent while the foliage gave movement to the design. 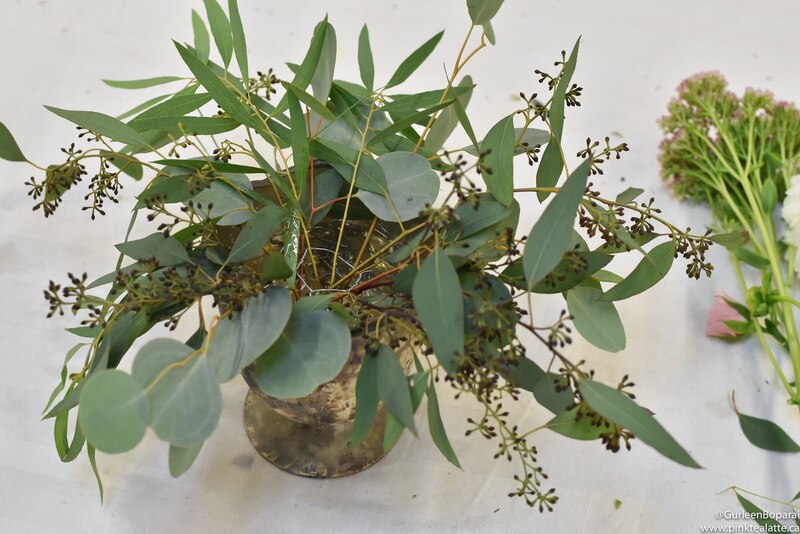 A good example is the feather eucalyptus and how it flowed down the side of the jar. A stunning example of the wild style by Estefani at Garden Party Flowers! The chicken wire helps keep the stems in place, but also increases surface area for more angled placement. The pedestal vase with the scalloped edge rim was the most challenging vase Estefani used, but also happens to be her favourite, as she loves rustic unique vases. I learned a common florist's trick using chicken wire so the scalloped detail was not too obscured. Beginning with a small square of chicken wire, manipulate the piece into a dome that would fit snugly inside the vase thus increasing the surface area of the otherwise shallow vase. Unlike the Mason jar arrangement, where she created height by keeping the flowers and foliage upright, for this arrangement, Estefani took advantage of the chicken wire and positioned the stems at different angles. By having the flowers and foliage extend along the horizontal plane, you create an illusion of a fuller and larger arrangement. I loved the grandness of this design with the oval shape and strategic placement of the foliage and flowers. Remarkably, all three arrangements used the exact same flowers and foliage! Once we were done with the first cylindrical vase, we dismantled the arrangement and used the same stems for the next vase. Estefani is showed so much creativity by arranging three distinct designs from the exact same stems. 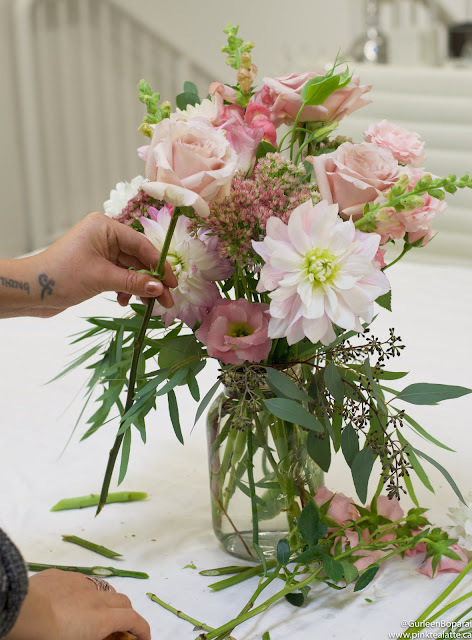 When working with flowers, if you are unhappy with the placement of a stem, re-position it to a placement you like better. All florists do this at the end of every arrangement until they are content with the final look. There is no one correct way when it comes to floral arrangements because it is a very subjective choice. I always want my flowers to retain their stunning beauty as long as possible. Garden Party Flowers suggest cleaning the vase and changing the water every two to three days, at this point it is also a good idea to re-cut the stems to keep them fresh. Another way to increase the lifespan of your flowers is to keep them in a cool environment. Flowers in a warmer environment, like by a heater or in direct sunlight, the opening of the buds is accelerated. It was such a pleasure to visit Garden Party Flowers' studio and getting to work with one of their many talented florists. I honestly cannot wait to try and arrange my next bouquet in a vase using everything I learned. If there is anything else you are interested in learning in regards to flowers, leave it in the comments below! I know I want to learn how to make floral crowns and visit some local nurseries in the lower mainland, so let me know if you want more flowers! 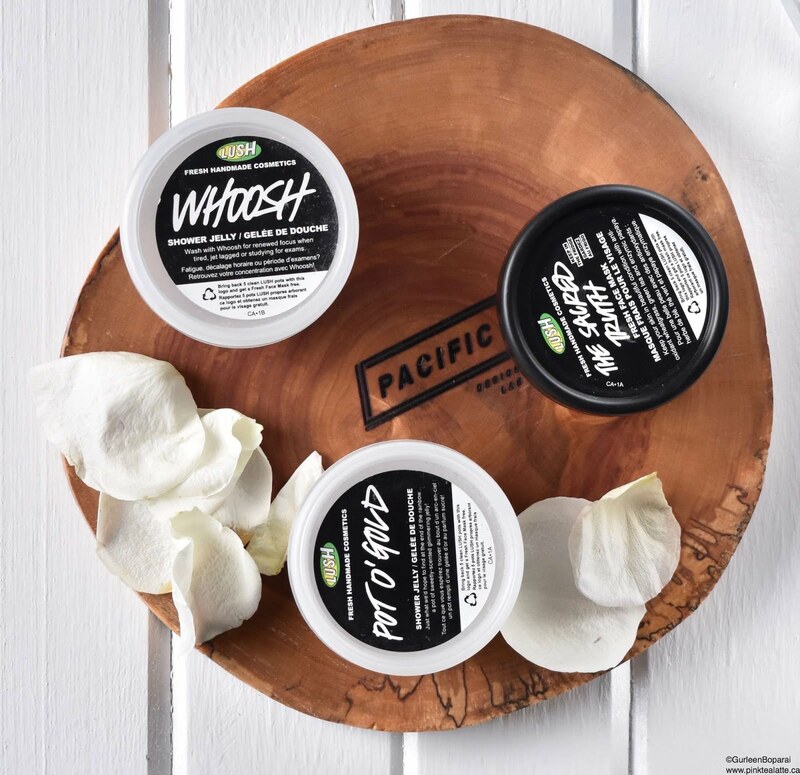 As promised, part 2 of my Lush Empties review. 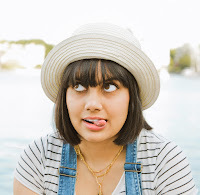 Click here for part 1 where I talk about Sympathy for the Skin, Rosy Cheeks, Whoosh and Pot O' Gold. This shower jelly smelled like I was standing outside in a pine needle forest on a cool winter day. The fresh scent really energized me in the morning. A great shower jelly scent and I most definitely will pick up another Needles and Pines in the future. I am going to be honest, I do not know how long I have had this empty tub because I frankly cannot remember a single thing about this fresh face mask! I decided to read up on The Sacred Truth mask on Lush's website and basically, the main ingredient is fresh papaya and is intended to be highly moisturizing thus recommended for dry skin types. Since I do not remember much about using the Sacred Truth, I have no opinion on this mask! I hate shaving partly because it is a tedious annoying task, but also I tend to always knick myself. D'Fluff helped make shaving a little better of an experience as it is not as messy as traditional shaving cream, but also lessened the number of cuts I gave myself. I probably will not re-purchase D'Fluff as I am not very fond of the candy strawberry smell. 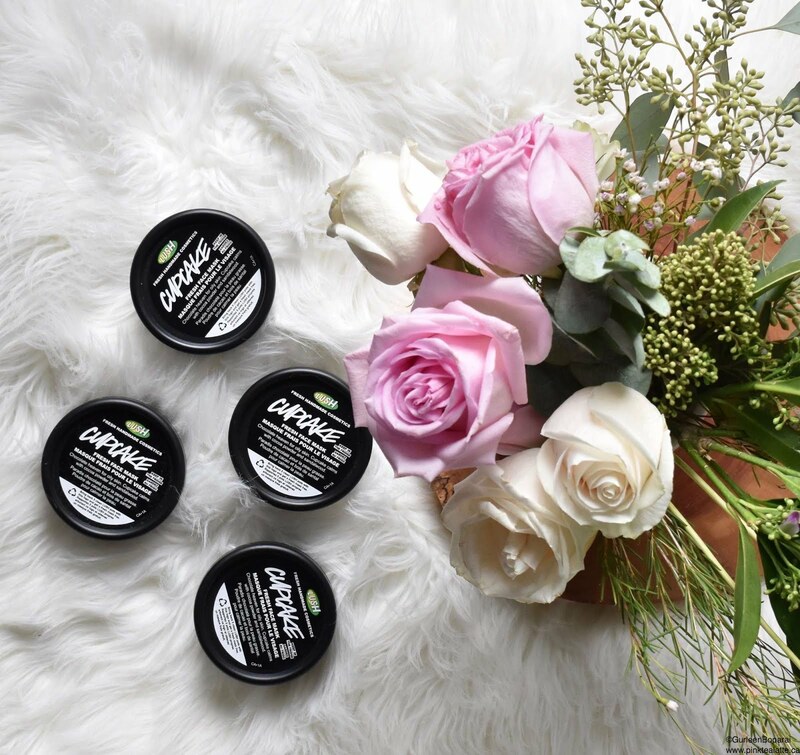 Over the many years of being Lush user, Cupcake still continues to remain my favourite Fresh Face Mask. 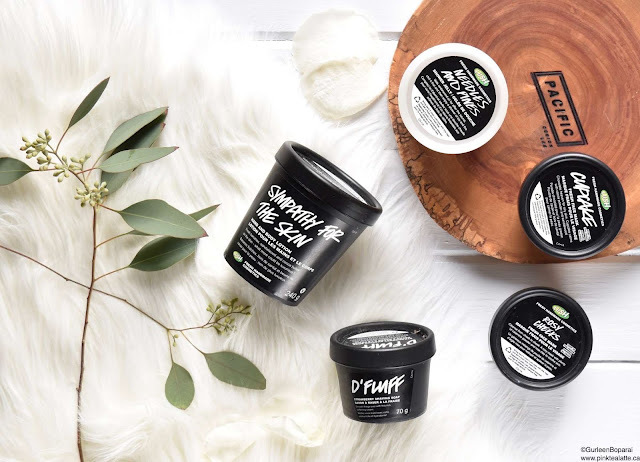 I have accumulated four empty pots of Cupcake and reckon I will gather many more until Lush decides to discontinue this mask which I hope does not happen any time soon. Those are all of my Lush empties - for 2016 at least! I will have my last product empties post on non-Lush brands published later this week. I had the most fabulous brunch this morning at Ritual, a hidden gem at the corner of Robson and Denman st. This adorable restaurant has been on my must visit list for quite some time, and I am so glad that I finally made it out to Ritual as the food was amazing. There is no doubt in my mind that I will be returning for more meals. For brunch, my friend and I were famished and basically ready to charge into the kitchen to eat whatever in sight. However, we decided to be civil and place our orders with the lovely server. I went with the Heuvos Rancheros (vegetarian with egg) while my friend opted for something sweet, Ritual's Banana's Foster Pancakes. The Heuvos Rancheros was fantastic and for something so simple, this dish was full of flavour. I was pleasantly surprised and could not believe how full it made me. I was struggling to finish the last few bites, and as much as I tried, I could not polish my plate off. That is how filling the Heuvos Rancheros was! The dish was also served with a slice of Ritual's Honey Corn Bread. 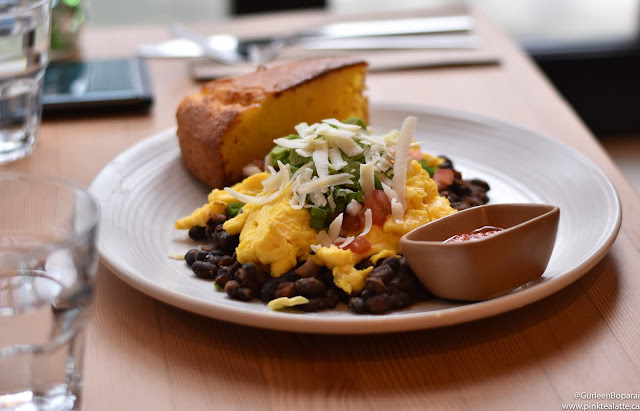 I have had corn bread in the past, but Ritual's is probably my favourite as it had a great honey flavour, but I loved how the texture of the cornbread was crispy on the outside but soft on the inside. Unlike me who chose a savoury dish, my friend got Ritual's Banana Foster Pancakes. 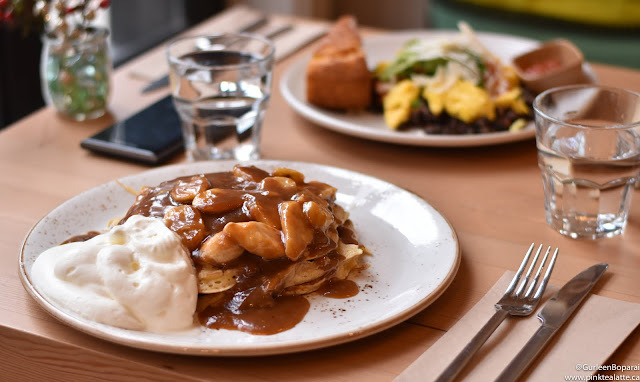 The pancakes were smothered in a delicious caramel bourbon sauce, topped with caramelized banana's and of course, a generous dollop of fresh whip cream. This too was very filing evident by my friends struggles at finishing the pancakes. I really liked their pancakes, they were light and fluffy and full of flavour. I am intrigued by Ritual's special event dinners and hope to check one out soon. That is what first got me interested in the restaurant. For those of you unfamiliar with Ritual, the restaurant hosts set menu dinners every so often. The menus for the events always look delicious and I am hoping they host a New Years one as I would love to go! Aside from the special dinners, I will most likely be dropping by for a normal dinner too! Let me know in the comments below if you have dined at Ritual and how you liked it? Also, what are some other restaurants I should eat at next?